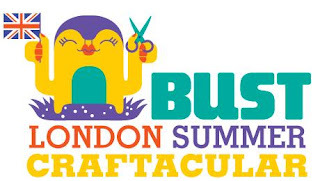 I know I never blog but I thought I would just let you know that I will be at the Bust Summer Craftacular tomorrow. So if any of you are free and fancy doing something crafty on a saturday then pop along. Not only will you be able to buy lots of crafty goodness there will also be activities to partake in and a pop up vintage tea room put on by the lovely team at lady luck rules ok. Yes it went really well victoria, it was completely knackering though im still recovering.